Solo: A Star Wars Story is set to be released on May 25th and is the second standalone Star Wars film to go through production problems. Ron Howard took over the project in June after the original directors Phil Lord and Christopher Miller were fired. Rogue One: A Star Wars Story had similar issues, bringing in Oscar-nominated filmmaker Tony Gilroy to work alongside director Gareth Edwards, overseeing the extensive reshoots the took place and the post-production process. 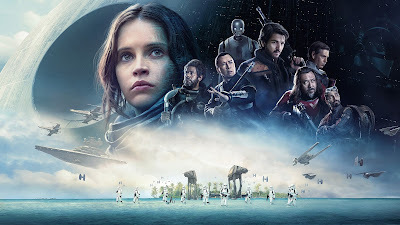 Rogue One: A Star Wars Story was directed by Gareth Edwards (Monsters) and stars Felicity Jones (The Theory of Everything), Diego Luna (Milk), Ben Mendelsohn (The Dark Knight Rises), Donnie Yen (Ip Man), Jiang Wen (Let the Bullets Fly), Forest Whitaker (The Last King of Scotland), Alan Tudyk (Con Man), Riz Ahmed (Nightcrawler), Genevieve O’Reilly (Star Wars: Episode III – Revenge of the Sith), Jimmy Smits (Star Wars: Episode II – Attack of the Clones), James Earl Jones (Star Wars: Episode IV – A New Hope), Valene Kane (The Fall), Alistair Petrie (The Night Manager), Warwick Davis (Star Wars: Episode IV – Return of the Jedi), Ian McElhinney (Game of Thrones) and Jonathan Aris (Sherlock). "From Lucasfilm comes the first of the Star Wars standalone films, Rogue One: A Star Wars Story, an all-new epic adventure. In a time of conflict, a group of unlikely heroes band together on a mission to steal the plans to the Death Star, the Empire’s ultimate weapon of destruction. This key event in the Star Wars timeline brings together ordinary people who choose to do extraordinary things, and in doing so, become part of something greater than themselves."